Seattle is a beer city. Besides the well-known and large scale breweries such as Pyramid and Redhook, you can’t swing an empty pint glass without it smashing against a local brewpub. Yet, if the lure of locally grown hops and grains isn’t enough to satisfy your taste buds, you can try your non-glass shard wounded hand at the expanse of esoteric beer venues in Seattle. If the idea of beer as a realm of culinary exploration is new to you, the best place to begin is at Über Tavern. This north Seattle tavern adjacent to scenic Greenlake is easily visible by its large bottle-shaped neon sign. Once inside, you’ll find a small, mellow environment that only seats a small crowd, but has plenty of open space amongst the bar, couches, and the gel-fueled fire at the round center table. The main feature of this establishment is the bar-length cooler, which houses the many varieties of unique beers offered. These beers from all over the world range from the classic Trappist beers of Belgium to African Chili Mead. What makes Über Tavern such a good place for those new or even those well-schooled in beer is the tavern’s accessibility. Due to the small size of the tavern, all the beers are easy to look over, the bartenders aren’t bogged down by floods of customers so are available to answer questions at length concerning their beers, and the menu itself contains a lengthy reference of various beer styles and their characteristics. 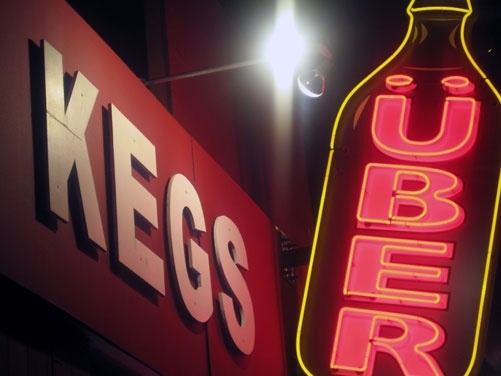 As a final bonus, Über Tavern also has kegs and bottles to go in case you can’t get enough. When you’re ready to take your beer drinking to the next level, Brouwer’s in Fremont is your place. Designed in the style of a beer hall with a modern edge, Brouwer’s features over fifty-taps of beer that are in constant rotation. The large bar is dwarfed by the gigantic walk-in cooler behind it, which features over a hundred bottled beers. Ask what’s all inside and you’ll get a thick packet of stapled pages listing unique American beers, such as the Alaskan Smoked Porter, and foreign imports topping out at two hundred dollars a bottle. To go with your beer, Brouwer’s also features a French-inspired menu of quick eats such as pâté, gratin, and the classic bar food – pomme frites. Spend an hour at the bar, listen, and you’ll overhear fellow patrons going down the list of beers, always seeking more flavors, which will let you know you’re in good company. After checking out Brouwer’s, head over to Wallingford, where you can find BottleWorks, Brouwer’s retail shop, featuring many of the same beers available in a less active setting. Though the shop may seem cramped and a little dark, the staff knows their stuff- if the slight differences between imperial stout and Russian imperial stout are your type of conversation, then this is the place for you. If it isn’t and you have no idea such a thing as imperial stout existed, the shop is logically arranged by style and region so that you can see the varieties of beers available and observe the subtle differences between them. If you don’t know where to start, Bottleworks features a tasting every Monday from 5 p.m.-7 p.m.
During late June to early July, for the ultimate in variety and bragging rights amongst your fellow beer-o-philes, check out the Seattle International Beer Festival. This yearly event, always cleverly advertised around the city, will set you back around twenty dollars to sample from vendors offering rare local beers often found in magnum-sized bottles, beers from unexpected places like Ethiopia, and flavor combinations you never dreamt possible. Though you may end up with a few system shocks from these odd brews, the chance to taste one that pushes the envelope of flavor is well worth it. But perhaps going through a catalog of beers may be a bit excessive for just a quick drink or a casual night with friends. Though, if you still desire a beer that is more than just a standard lager, then the Stumbling Monk on Capital Hill should be your watering hole. The bar features a spread of Belgium beers listed on a chalkboard with small drawings of the specialized glasses they come in. The place is a stripped down and direct small bar, with low light and no pretension. The place is sure to be filled with a mellow quiet crowd of colorful beer lover’s representative of the neighborhood. While the bar does not have a lot of flare, the unique flavors of these beers and good conversation, may be all you need. Corey Kahler is a cook and writer living in Seattle.